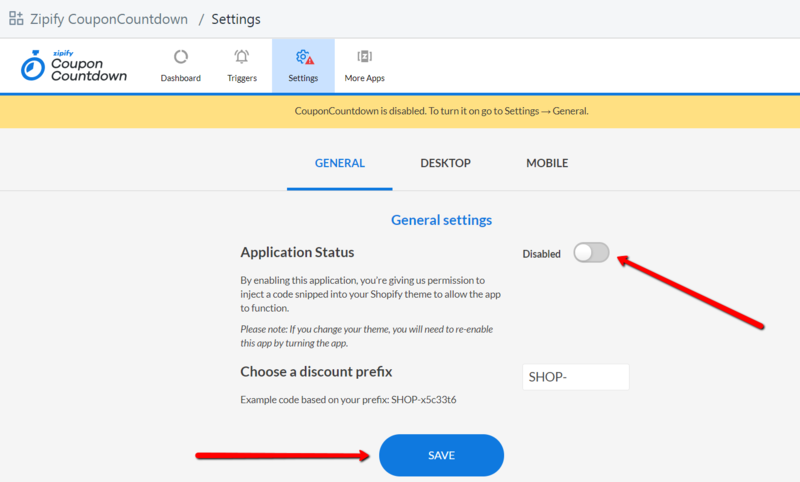 Learn how to turn the app on/off and how to set the discount code prefix text! The first thing you need to do once the application is installed on your store is to read and accept the Terms Of Service agreement. Then you'll able to access the app's admin interface. The app is disabled by default which is indicated by a red triangle sign over the Settings tab in the navigation menu. This will add some code into your store's theme (including styles) which is needed for Coupon Countdown to function correctly. In order to disable the app just head to Settings -> General section and set the Application Status switcher there to the "OFF" position and then click the "Save" button. IMPORTANT! Always disable the app before deleting it from your Shopify store. Disabling it first removes all previously injected code from your store's theme ensuring that no code is leftover by the app. Choose a discount prefix (this will appear before each auto-generated discount, for example SHOP-x5c33t6) - This setting allows you to set a unique prefix that is added into each auto-generated discount's name. Use it to distinguish Zipify Coupon Countdown generated discounts from those you created manually within your Shopify Discounts section.